celery root related recipe (for now): celery root/mashed potatoes with sautéed garlic and onion. For my first mashed potato-making experience, I was quite impressed with how well they came out. Cooking, although intimidating from a distance, can be extremely satisfying. You just can't downplay the satisfaction of handcrafting something yourself. The farm has been more than just a learning experience about how to grow vegetables. It has unlocked a world of possibility I never imagined. Playing basketball and living in New York City, seemingly so far removed from arable land throughout my life, I had never even thought much to ask about what I was eating. Now thinking about what I eat and relating how I physically feel to what I eat has offered some incredible revelations. No one has said eat this or don't eat that, but something about being around such beautiful and delicious freshly grown food has slowly seeped into my brain and it's difficult to not at least think before I choose to eat something. Seems logical, but when you live in one of the fastest paced cities in the world, quick decisions have a funny way of overriding a lot of well thought-out choices. But I digress, now onto the mashing. Although I only had two celery roots on me, I added 6 potatoes, but this recipe can be adjusted in any way; potatoes and celery root being interchangeable. My potatoes, Russet Burbanks to be exact, were somewhat small hence the six. First things first, wash, peel and cut these underground dwellers. 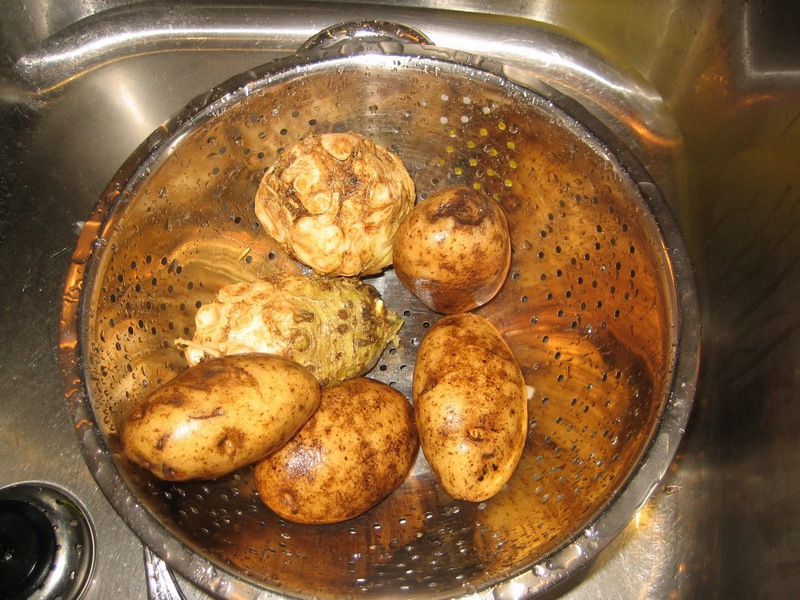 Once peeled and washed, putting the potatoes in cold water prevents them from spoiling while you finish the rest. It was suggested to me to keep the potatoes sliced thick, preferably in half. Small potato chunks can create a watery texture. On the other hand, the celery root is much thicker, so it takes longer to cook. It's best to cut the celery root into smaller pieces than the potatoes, 1/8 pieces worked for me. They ended up finishing around the same time. Dump all the cut potatoes and celery root into a pot with cold water filled slightly higher than the level of the vegetables. Pour yourself a glass of wine, whiskey, water or whatever you like, put on some of the incredible Tuesday night Soul II Soul benefit for Haiti concert with Lettuce ft. Maceo Parker and Dr. John that you went to and leave the pot on high heat. Once the water starts boiling, reduce the temperature and simmer until the celery root and potatoes are tender enough for a fork to go right through. Start chopping up the onion and peeling the garlic, when the vegetables in the pot seem close to being done, start sautéing the chopped onion with the minced garlic cloves. When ready, drain the pot into a colander and shake it around to get out all the excess water, then put the potatoes back into the pot, mix in 3 tablespoons of butter, the onion, garlic, salt and pepper. Finally slightly warm the 1/3 cup of milk and add as you mash and stir the whole pot together. Some aggressive stirring and mashing is needed and you can get this stuff pretty smooth. Not as smooth as Maceo Parker singing Ray Charles Tuesday night though...Heyo. 1. Wash, peel and cut the potatoes and celery root. Potatoes shouldn't be cut too small, but the celery root can be cut small since it may take longer to cook than the potatoes otherwise. 2. 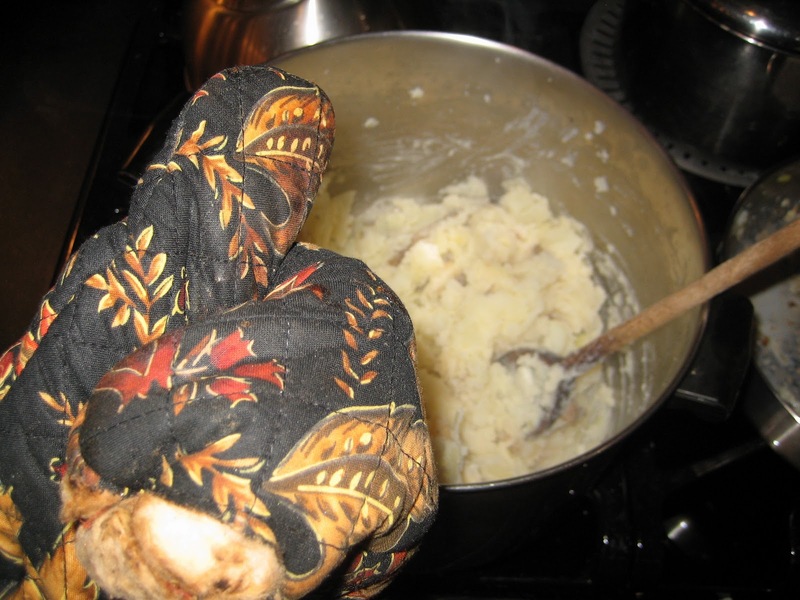 Put the cut celery root and potatoes in a large pot of cold water slightly above the level of the vegetables. Turn on high heat. 2b. Sauté onion and minced garlic in a separate pan. 3. Once the water boils, reduce to medium until veggies are tender enough for a fork to go all the way through. 4. Drain the pot of all water and place dry potatoes and celery root back into the pot. 5. While still hot, add 3 TBSP of butter and stir in the sautéed garlic and onions. 6. Add 1/3 cup of warm milk, salt and pepper to taste and stir to desired texture. like the maceo parker tip too!! Looks totally delish!! I can't wait till i get to try some of this cooking...when are we going to cook a meal together!?!? HA, glad you enjoyed that Randell, it was truly amazing. We cannot wait for the grand opening. I will be first in line, I can tell you that right now. I'll have my camera and notepad in hand ready to go. I'm nervous, two great cooks looking at my first attempt at mashed potatoes. Hil, I'm all about a joint meal venture. You lead the way, I'm all about it. My repertoire is pretty limited though, I've disclosed pretty much everything I can make with the exception of some top notch grilled cheeses and quesadillas I've been perfecting since I was about 10 years old HA (It's all about the pan).